Congratulations to the winners—and all the participants—of the fall race series at Tempe Town Lake! Cedric Lorch with father Martin as crew (usually) won the fall C14 fleet championship at Tempe Town Lake. 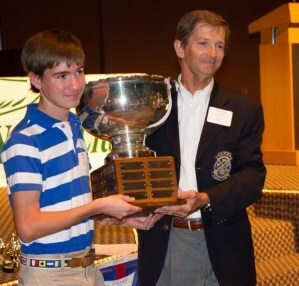 This picture was taken as Martin accepted the club championship trophy in May. Emory Heisler is the Buccaneer fleet winner. In C14, Cedric Lorch takes the prize. New Laser sailor (and longtime Thistler) Ben Doane wins in Laser. And in the very lightly-contested Portsmouth class, Clay Poulson reigns. Now, an explanation of the way the Buccaneers have been scoring their races, which will be up for discussion for all fleets for fall of 2014. The Bucc fleet felt that this inflicted too great a penalty on boats that missed a race day and have had a fleet rule that says that instead of scoring “one more than the number of boats entered in the series,” they would score one more than the number of boats that had shown up to compete that day. As an example, if there are 10 boats signed up for the series and you missed a race day, under the RRS you’d be scored “11” for each race run that day. However if, say, three boats competed that day and you missed it, you’d be scored “4” for each race run. It could affect the series outcome, though we throw out 20% of each boat’s finishes, which mitigates the effect of missing a day. Fleet Captain Greg Woodcock noted that the RRS is clear that this scoring change can only be made by changing A4.2 in the Sailing Instructions, so the Bucc fleet’s change will need to be written into the SIs. And other fleets like the Bucc rule and will consider adopting it in fall of 2014 (the first time it could be done without disrupting our club championship). If you’d like this rule adopted, let your fleet captain know.